"Kateb, like J. S. Mill, asks what objects of secular faith may candidly be used to supplant religious belief. Humanity is the answer he suggests--but humanity regarded not as the collective hero of progress or enlightenment, but as the most interesting part of nature for better and for worse: the part that holds up a mirror to the rest, even though the rest cannot recognize itself in the mirror. This is a disturbing, adventurous, and original-minded work. " 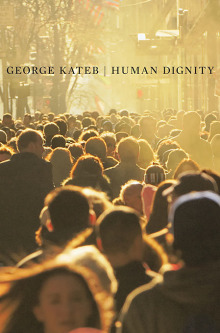 My book is a defense of human dignity. I mean that it is a defense of the equal status of individuals or persons vis-à-vis one another, and a defense of the superior stature of the human species vis-à-vis all others species. The concept of human dignity as I use it is thus made up of two related parts, which have a complex and sometimes troubled relationship with each other. The trouble shows itself when we realize that what once enhanced the species degraded the masses. The further irony is that what now enhances the life of the masses degrades the planet and thus interferes with the greatest expression of the stature of the human species, which is to try to save nature from cataclysmic human exploitation. What is the use of the concept of human dignity? Why does human dignity need a defense? The concept of human dignity is first a contribution to the theory of human rights. The failure by the state to recognize and respect human rights is an assault on human dignity, the dignity of individuals. The elaboration of the concept of human dignity provides a significant part of the philosophical basis of human rights. An appeal to human dignity generally cooperates with the other part of the basis, the moral arguments for human rights. I stipulate that human dignity is not a moral idea but rather an existential one, because it pertains to proper recognition of the identity of human persons and the human species, not to the moral aim of preventing or reducing suffering. I consider and try to rebut the skeptical view that the concept of human dignity adds nothing to the theory of human rights. My chief theoretical purpose is not to present a detailed indictment of oppressive states, but to take issue with those critics of human rights who find harm to human beings when a state works hard to protect their rights. I explore two critical views, in particular, that question the validity of human rights on the grounds that guaranteed rights go against the best interests of either society as a whole or many individuals as individuals. The two theories are utilitarianism and virtue-ethics. Thus, the salient fact is that these two theories side with the people, not with those who oppress them, and yet hold that the people are not well served by individual human rights - at least if those rights are defended as absolute. I deal with both views very selectively, and try to rebut them partly on the grounds of human dignity. Second, I offer a defense of human stature - the worth of the human species - against two tendencies of thought. One of them is philosophical naturalism, which is a pervasive and longstanding doctrine. Its advocates hold that the human species is only an animal species; but I wish to claim that humanity, alone among all the other species, is only partly natural. The philosophical naturalists want to efface human specialness, its special separateness in nature, and at best reduce humanity to a complex animality, whereas I want to say that humanity is not merely natural. Insofar as it is not natural, it is exempt from the determinism of natural causation, no matter how humanity is constrained by natural limits. If it is only partly natural, what else is it? How is the non-natural part to be conceived? The reason for the partial exemption from nature is the unique human ability to use language, which denaturalizes - not denatures - the human species. The non-natural aspect is mental, hence artificial; it opens up the possibility of human freedom; being free, human beings are creative in more than an adaptive sense and hence continuously unpredictable, unlike all other species. Language is the key to human uniqueness because it enables the indefinite creation and re-creation of the whole human artifice, a second world besides the natural one. My further judgment is that just by being the only partly non-natural species, humanity is the highest species. That's what the stature of the species comes to. The other view which I oppose is that the earth would be better off without the human species. This view is rightly concerned with the desolation that humanity has brought to the earth and will continue to bring. But I try to counter this second view pitted against human stature by saying that because the human species is only partly natural, it alone among species is able to make an indispensable contribution to nature on earth and in the universe: the human mind, based on the brain, but not reducible to the brain, allows it to serve as the steward of nature. If for the time being we posit that the human mind is the only mind in the universe, or that if there are other minds, they are inaccessible to ours and ours to theirs even if we somehow encounter them, then the human stewardship of nature, as I envisage it, becomes tenable. The stewardship consists not only in preserving what we can of nature on earth, but also in knowing the truth about universal nature and its history and, where humanly possible, appreciating and admiring it, and wondering at it. Only the human mind can perform these activities. Yes, of course, the existence and value of these activities isn't apprehended by nature, their object, but that fact makes the value of the effort all the greater, despite or because of the futility inherent in nature's unawareness and unresponsiveness. Imagine an earth with all its creatures and things, and a universe in its vast purposelessness, and both earth and universe without any mind that knows that they exist, and then appreciates and admires them, where humanly possible. I am not saying that unless they are thought by us they would not exist, but rather that unless they are thought, they might as well not exist or not have existed. They mean nothing to themselves, despite the will to persist, the will to self-preservation among animals. If the human species became extinct, it would not matter that the earth and the universe exist - unless you think that one day another kind of mind would come into being. In sum, I oppose for the sake of human dignity the naturalist philosophical reduction of humanity and the speculative wish to see the earth rid of the human species. What sort of defense of human dignity, individual status and species stature, do I offer? It is a purely secular defense. I don't want to use any religious arguments, not even those which make extraordinary claims for human beings above all other kinds of being on earth. I think that we must do without any religion or theology because we must keep un-provable or unwarrantable claims to a minimum. Secularists can of course learn from theology and religion, when we don't take them literally. Our conviction is that theology is esoteric anthropology and religious practice is often disguised aestheticism. George Kateb is William Nelson Cromwell Professor of Politics, Emeritus, Princeton University. His writings include Hannah Arendt: Politics, Conscience, Evil (1984); The Inner Ocean: Individualism and Democratic Culture (1992); Emerson and Self-Reliance (1994); 2d ed, 2002); and most recently, Patriotism and Other Mistakes (2007). At Princeton, he was formerly Director of the Program in Political Philosophy, Director of the Gauss Seminars, and Director of the University Center for Human Values.